Legendary Indian musician and former UC Santa Cruz Distinguished Adjunct Professor Ali Akbar Khan died on June 18 at his home in San Anselmo, Calif. He was 87. One of the world's most accomplished Indian classical musicians and raga composers, Khan was revered by jazz, classical, and pop musicians worldwide. He performed for more than 8 million people, recorded nearly 100 albums, and received numerous awards and honors throughout his career--including a MacArthur Foundation "Genius" award, five Grammy nominations, and a prestigious National Heritage Fellowship from the National Endowment for the Arts. 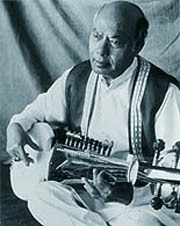 Named a national treasure by the Indian government in 1989, Khan was instrumental in helping popularize North Indian Classical music in the West. In 1971, he performed at the renowned Concert for Bangladesh benefit alongside Ravi Shankhar, Bob Dylan, Eric Clapton, and George Harrison. A virtuoso of the 25-string sarod, Khan was first brought to the United States in 1955 at the invitation of violinist Yehudi Menuhin, who described him as "an absolute genius" and "the greatest musician in the world." 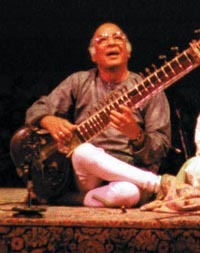 In 1999, Khan was named Distinguished Adjunct Professor of Music at UC Santa Cruz after the campus established a $250,000 Ali Akbar Khan Endowment for Classical Indian Music. Contributors to the endowment included Silicon Valley entrepreneurs Talat and Kamil Hasan, Sid and Anu Maitra, Arjun and Kiran Malhotra, and Shiv and Kiran Nadar. At UC Santa Cruz, Khan presented concerts, master classes, and workshops, both on his own and with his associates. He also served as an adviser to the Arts Division in the development of courses and resources in Indian classical music, and helped facilitate bringing outstanding guest performers and teachers to the campus. In 2000, the Hasans contributed an additional gift of $350,000 to establish the Kamil and Talat Hasan Endowed Chair in Classical Indian Music at UC Santa Cruz, which provides ongoing annual support for the campus's programs in Indian arts. "To refer to a tradition as classical is to concede a golden age to a distant past. Those of us who are lovers of Indian classical music have not had to make such a concession. The twentieth century has witnessed a pantheon of musical titans who will enter history as some of the finest musicians ever. Ustad Ali Akbar sits on this pantheon as one of the greatest of the greats. I have heard musicians who were senior to him and from rival lineages refer to his musicality as unmatched and his contributions as unrivalled. To have such a maestro in our presence has been an historical privilege, a station that allowed us to revel in the ephemeral presence of musical making while knowing we were a part of history in the making. Those of us in Northern California have had another privilege. In 1967, the great ustad (master and maestro) established the Ali Akbar College of Music in San Rafael where students visited to learn from him as well as from other notable musicians who came to teach and perform there, developing the larger Bay Area into one of the more resonant communities of connoisseurs outside of India, expanding in the 1990s to the University of California, Santa Cruz. The University, led by Dean Edward Houghton of the Arts Division and Professors Fred Lieberman and Linda-Burman Hall in the Department of Music, cultivated a relationship with Khansahib (sir Khan) that led to his being named, in 1999, Distinguished Adjunct Professor of Music at UCSC, which paved the road to two of the very first endowments of their kind in the United States, the Ali Akbar Khan Endowment and the Hasan Endowed Chair of Classical Indian Music. Indian classical music is an oral tradition and so the passing of our ustads has a particular sting-we associate their art forms less with compositions, which have the potential for inscribed legacy, and more with live performances. But the cycle of loss and renewal has revolved for countless generations; an ustad is not just a maestro performer but a master teacher and in that respect Ustad Ali Akbar Khan was prolific-he nurtured numerous students into maestros who will carry forth his heritage as well as the repertoire of his lineage, known as the Maihar Gharana. His eldest son, Ustad Aashish Khan, is one of the senior musicians today and has been teaching workshops during the spring quarters at UC Santa Cruz for the past several years. Ustad Ali Akbar Khan is no longer with us, but his legacy will continue into the distant future. Through his students, his school, the endowment named after him at UCSC, his recordings, and the pinnacle of musical achievement that was his, the music that was Ustad Ali Akbar Khan's will enrich us for generations."